Our school is winding down for the summer. We’ll keep the basics going during the next ten weeks, but will take a needed break from history, science, and grammar, which will give both Mom and kids time to work on non-school related projects. 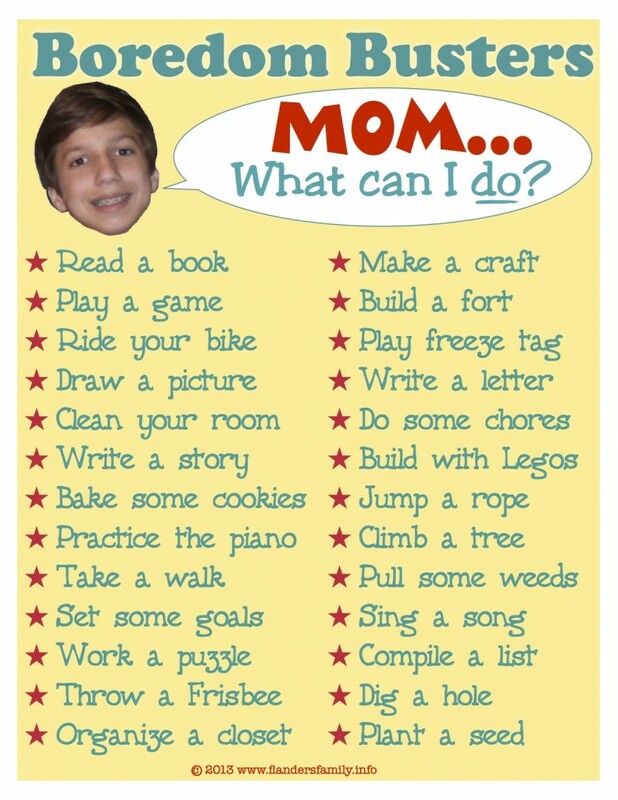 Some of our children (including the boy pictured on this printable) are never at a loss for things to do or stuff to make or games to play. Their only problem is finding time to fit it all in, or picking and choosing which project to focus on at any given moment. We have other children, though, who seem overly-susceptible to boredom, especially when their access to electronics has been restricted. These little guys would spend the entire summer playing videogames if we’d allow it. But we don’t. They are granted 15 minutes of computer games per schoolday (30 minutes on the weekends), after which they must find other, tech-free things to do with their time. Consequently, I hear, “What can I do now, Mom?” much more often than I’d like. I’m beginning to sound like a broken record enumerating all the various options, so rather than keep having that conversation, I decided to create a handy little (printable) list of boredom busters to which I new refer these stultified sons whenever they tell me there’s nothing to do. Do your children ever complain of being bored? What sorts of things to you suggest to remedy their boredom? clean ur room!!! love it!! I like “dig a hole” That is funny. Definitely a boy thing. But it works off energy. Great post. Yes, definitely a boy thing, and one that has kept several of my guys happily occupied for hours or days at a lick. Thank you very much for this list … Yes my children complain about being bored at times … Especially when the ipad or tv go off ….thanks again .